Bioanalysis studies are an integral part of therapeutic development. Scientists must quantify drug products to impeccable levels of sensitivity and selectivity to ensure proper dosage, efficacy and safety. At the same time, many labs are facing the inevitable move to more complex large molecule and biologics bioanalysis. As therapeutics continually evolve to become more complex, we can help you to keep up with the pace of change with the right technology and the right support. In 1981, SCIEX revolutionized small molecule bioanalysis by launching the first commercially successful triple quadrupole MS instrument, starting a long legacy of pioneering solutions that give bioanalytical scientists a platform to master high-throughput therapeutic quantitation while achieving the required levels of compliance and data quality – for both small and large molecules. Today we continue to empower scientists to reimagine therapeutic development in more innovative, productive ways. Explore how you can benefit from SCIEX innovative hardware, software, lab-tested methods and expert support so you can simplify method development, accelerate your workflows and get accurate results, faster than ever before. Explore how you can benefit from SCIEX innovative hardware, software, lab-tested methods and expert support so you can simplify method development, accelerate your workflows and get accurate results, faster than ever before. The power of our best-in-class LC-MS/MS systems, compliant software, and outstanding application support can transform bioanalytical labs capabilities. Quantifying levels of peptide and protein therapeutics with increased confidence is critical. SCIEX offers robust, reproducible and sensitive solutions for intact and peptide level analyses. LC-MS/MS analysis methods can offer highly selective and specific quantitation for challenging molecule types such as mAbs and antibody drug conjugates. Get selective quantitative analysis of oligonucleotides in complex biological matrices and accurately distinguish large metabolites from the full-length oligonucleotide. Detect biomarkers in complex matrices with ultimate confidence. Immunoaffinity enrichment strategies, or differential ion mobility technology can be employed to enhance the overall assay sensitivity and selectivity. Explore how to approach therapeutic quantitation in more innovative and productive ways with high-performance hardware, software, sample prep and lab-tested analysis methods. 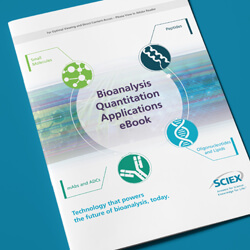 This eBook is packed with technical articles on a range of applications and techniques, to help you discover how you can transform your quantitation workflows.